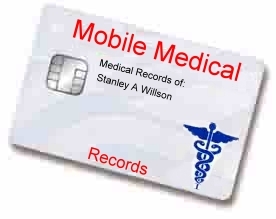 Mobile Medical card could provide a means of carrying your medical records with you at all times. 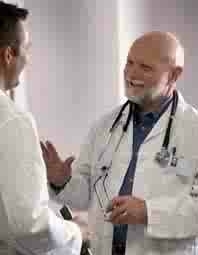 Incase of a medical emergency your entire medical history will be just a click away for the treating physician. The Mobile Medical Card is currently under research and development. Our goal is to have every ambulance and emergency room using a generic card reader with the ability to retrieve your entire medical history such as medications, allergies and much more. A smart card resembles a credit card in size and shape, but inside it is completely different. First of all, it has an inside -- a normal credit card is a simple piece of plastic. The inside of a smart card usually contains an embedded 8-bit microprocessor. The microprocessor is under a gold contact pad on one side of the card. Think of the microprocessor as replacing the usual magnetic stripe on a credit card or debit card. Smarts cards may have up to 1 kilobyte of RAM, 24 kilobytes of ROM, 16 kilobytes of programmable ROM, and an 8-bit microprocessor running at 5 MHz. The smart card uses a serial interface and receives its power from external sources like a card reader. The processor uses a limited instruction set for applications such as cryptography. Using Smart Card technology your medical records will be stored for fast retrieval.